The stunning Temple Dining Collection is as sleek and sophisticated as they get! This furniture range is the epitome of modern design that is forward thinking in its construction. This striking collection is not for the faint hearted; the silhouettes and fabrics make a bold statement that will revitalise your dining room in an instant. 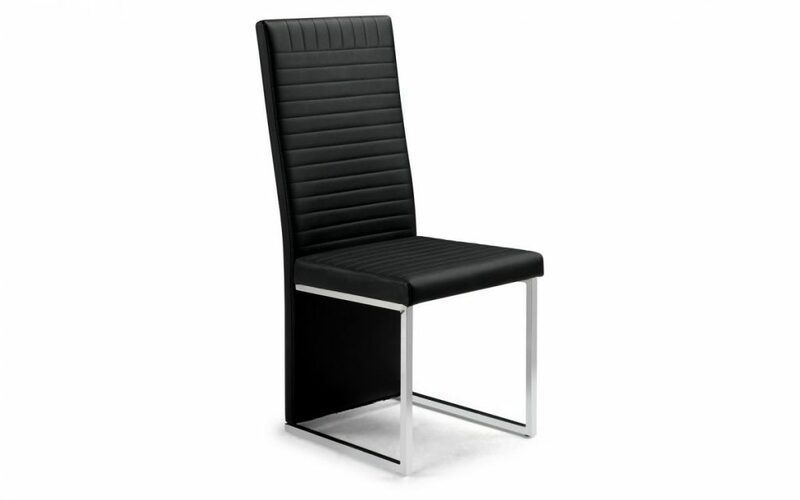 The Dining Chair features sumptuous faux leather and is padded and stitched from head to toe on an impressive solid back panel. This dining chair complements any item in the Temple Collection. PRICE SHOWN IS PER CHAIR, SOLD IN BOXES OF TWO ONLY. Chrome & Black Faux Leather. Chromed Metalwork & Black Faux Leather. TEMPLE Black Glass & Chrome Dining Table & 4 Black Faux Leather Chairs.